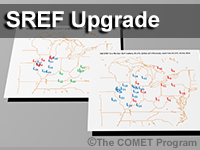 The Short-Range Ensemble Forecast (SREF) system underwent a major upgrade in Fall 2015. The intended result of the upgrade was to improve the SREF ensemble spread and probabilistic skill, and to reduce a cool, wet bias in surface and near-surface temperatures and moisture. This 20-minute lesson addresses the changes to improve the SREF, including the increase in ensemble size, the increase in initial condition and model physics diversity, and drier land surface parameters to lessen the cool, wet bias. Each is introduced by comparing the old and new SREF forecasts for a potential winter storm from December 2014. The results from the case study and long-term seasonal results are used to show the extent to which changes to the SREF succeeded in improving its forecasts.